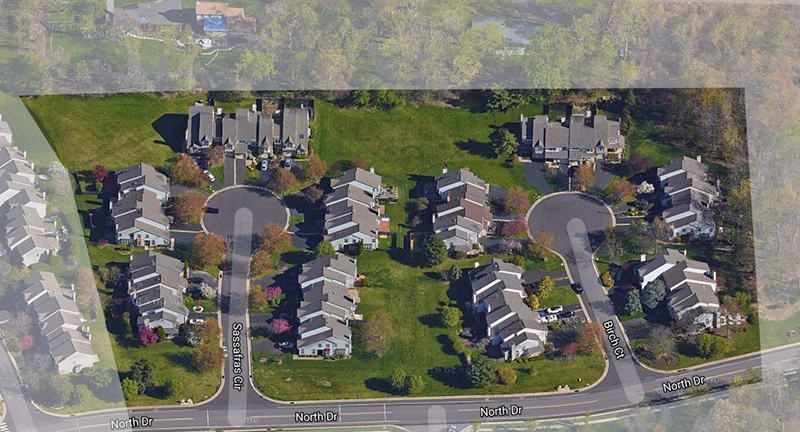 Eagle Trace is that area comprised of 43 Newtown Grant townhomes located on Birch Court and Sassafras Circle in Newtown Township, Bucks County, PA. Access to this sub-neighborhood is from North Drive onto either of these streets. There are 10 townhome clusters in Eagle Trace, each having from 4 to 5 homes per cluster. Therefore, nearly half of the homes are end units. Eagle Trace and Willow Creek are managed together under a single homeowner association. These townhomes were built in 1988 and 1989. Typical homes range from approximately 1,600 to 2,100 sq. ft. The homes have 2 to 3 bedrooms with 2‑1/2 baths. Approximately 4 out of 5 (80%) have basements as well as 1-car garages.